17 year old Cale's very opinionated view on everything sports. 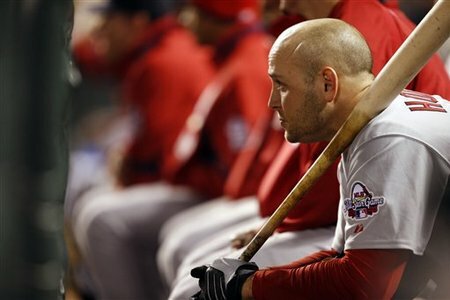 Matt Holliday (above) watches the game from the dugout. 1. Matt Holliday – Mets. The Mets need offense, plain and simple. They have the money, and want to add the big bat. 2. John Lackey – Red Sox. Boston’s rotation was almost a sure thing prior to last season. Now, Beckett and Lester are the only two definite starters, so signing Lackey is a top priority. 3. Jason Bay – Red Sox. Boston is the only place Bay has won, and he fits in very nicely there. I expect him to wait until Holliday signs, but after realizing Boston is his best spot, he will resign. 4. Chone Figgins – Cardinals. A bit of a surprise here, as most believe Figgins will either sign with the Phillies or return to the Angels. However, the Cardinals struggled with solidifying the top of their lineup all season, and Troy Glaus is no longer a sure thing at the hot corner. 5. Randy Wolf – Dodgers. L.A. is in the same situation as Boston, and have no idea what their rotation will look like next season. It’s highly unlikely that the Dodgers could acquire Roy Halladay, so Wolf is a must to bring back. 6. Andy Pettitte – Retirement. Yes, Pettitte is finally going to walk away. After winning a World Series in 2009, who wouldn’t want to go out on top? 7. Jose Valverde – Yankees. This will be the biggest splash of the offseason in the Bronx, as the will sign Valverde to set up Rivera, and possibly be his replacement. 8. Marco Scutaro – Red Sox. The Sox let SS Alex Gonzalez walk, and Scutaro fits nicely. He can bat at either the top or bottom of the lineup, and will help SS Jed Lowrie stay fresh throughout the season. 9. Adrian Beltre – Angels. They will need to fill the void that Figgins leaves, and I don’t think that they are ready to hand over the job to minor leaguers yet. This signing makes much more sense if the Halos are unable to bring back OF Vladamir Guerrero. 10. Rich Harden – Mets. I believe the Red Sox will get Halladay, and that is why I have Harden going to the Mets. In desperate need of starting pitching and a winning club, look for New York to go on a spending spree to try and fill the stands at Citi Field. 11. Mike Cameron – Royals. Kansas City already declined Coco Crisp’s option, and they need a center fielder. Frankly, the need elsewhere for Cameron’s services is limited. 12. Johnny Damon – Giants. The Giants need to add offense, and Damon would fit nicely by the bay. Damon would also be the final piece of an outfield that includes Aaron Rowand and Nate Schierholtz. 13. Orlando Hudson – Diamondbacks. It was a mistake letting Hudson walk in the first place, and Arizona was a dreadful team last season. They need to make improvements, and second base is one of the many holes on this club. 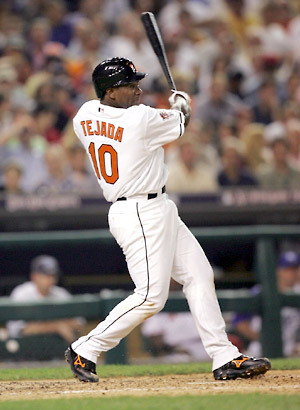 Miguel Tejada (above) could dawn that same Orioles' uniform again. but I just can’t see that happening. After the relationship soured between Baltimore and Melvin Mora last season, a hole at third base opened up for Tejada to step right back into. 15. Joel Pineiro – Mets. New York needs rotation help, and its no secret that GM Omar Minaya likes the idea of building a latin oriented team. 16. Nick Johnson – Orioles. Baltimore let 1B Aubrey Huff go at the trade deadline, and can afford to offer an incentive laden deal to the oft-injured Johnson. 17. Aroldis Chapman – Reds. This could be the surprise of the offseason. After all the hype, when teams actually see him throw, I believe that his value will fall in the eyes of GMs, and will join the Reds rotation of the future, Edinson Volquez, Johnny Cueto, and Micah Owings. 18. Marlon Byrd – Rangers. It is the only place where Byrd has had success in his major league career, and there is not much of a market for center fielders, prompting the Rangers to keep Marlon. 19. Vladimir Guerrero – Twins. This is another surprise pick here, but Minnesota needs to add a bat to help MVP Joe Mauer and 1B Justin Morneau. Guerrero would be the perfect DH to open a new ball park in the Twin Cities. 20. Felipe Lopez – Dodgers. With Orlando Hudson leaving the Dodgers, Lopez fits right in as a bat in the No.2 hole of the line up, or down at the bottom. 21. Adam LaRoche – Braves. LaRoche has spent most of his big league career in Atlanta, and the Braves can’t afford to lose too much offense. Look for LaRoche to get a pay raise to ensure that he doesn’t leave Georgia. 22. Rafael Soriano – Angels. Adding this right-handed late inning reliever will give L.A. the ability to play the numbers, and put in either Soriano or closer Brian Fuentes based on matchups. 23. Jon Garland – Twins. Minnesota would like another arm to go in their rotation, and Garland would be a nice addition. He is one of the lower pitchers of this year’s crop, so his price will not be outrageously high. 24. Carl Pavano – Nationals. Pavano was given a shot by the Indians last season, and was then traded to Minnesota. While Carl could still return to Cleveland, the Nationals are in need of a veteran starter, and a stop gap until all their young pitching talent arrives. 25. Brad Penny – Diamondbacks. Arizona needs everything, and Penny would give the D-Backs a deeper rotation, as well as a veteran starter. 26. Erik Bedard – Dodgers. Bedard is often injured, and this could lower his price. However, price isn’t much of an issue in L.A. Bedard is also rumored to be a pain in the clubhouse, in which he would fit right in with Dodgers OF Manny Ramirez. World Series MVP Hideki Matsui (above) won't leave the Bronx. 27. 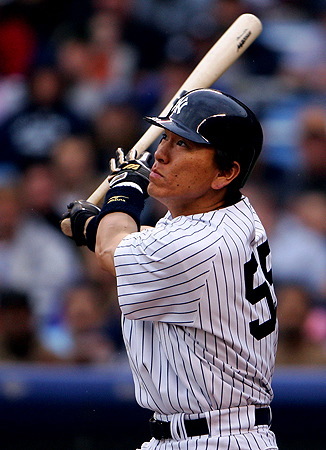 Hideki Matsui – Yankees. Believe it or not, the Yankees need the Japanese media in New York. Not to mention, Matsui was just World Series MVP, and there is no way that he is let go. 28. Bengie Molina – Mets. The Mets need bats, and their offseason spending frenzy will continue with the signing of Molina. Acquiring one of the best hitting catchers in baseball will help New York build a deeper line up. 29. Mike Gonzalez – Braves. A possible destination is in the Bronx, but if Soriano leaves Atlanta, Gonzalez may like having the closer’s role all to himself. 30. Jason Marquis – Rockies. Marquis had a stellar first half in Denver, but struggled down the stretch. I believe that he will hold out in hopes of a bigger deal, but the market will not play in his favor and force a return to the Rockies. 31. Placido Polanco – Rays. Money isn’t a plenty down in Florida, but after trading 2B Akinori Iwamura, the Rays could use a stabalizing force at the top of their line up. CF B.J. Upton was inconsistent last season, which is why signing Polanco could happen. 32. Tim Wakefield – Red Sox. Boston’s rotation is very uncertain, and Wakefield has only ever played for one team. If Wakefield doesn’t return to Boston like I believe, look for retirement. 33. Ben Sheets – Rangers. Sheets has taken a year off to recover from shoulder surgery, and looks to mount a comeback. Not many teams will be willing to offer him a contract, but the Rangers are always in need of starters, and could offer him an incentive laden deal. Not to mention, Sheets is the same kind of pitcher that owner Nolan Ryan used to be, so that must make him attractive. 34. Doug Davis – Brewers. Davis has already played for the Brewers, and Milwaukee doesn’t have the money to sign a top-notch starter. Davis’s signing looks even more likely since the Brewers claimed him on waivers in August but couldn’t work out a deal. 35. Jarrod Washburn – Mariners. There were no bitter feelings between the two sides after trading Washburn to Detroit, and the pitcher said that he would like to return to Seattle. The Mariners aren’t deep on pitching, so bringing back Washburn makes perfect sense. 36. Russell Branyan – Mariners. I don’t believe that any other club will take the chance of signing Branyan, for he very likely could be a one year wonder. Also, Branyan has the desire to stay in Seattle, so why would he leave? 37. Billy Wagner – Nationals. Wagner has questions about his health and age, which makes him an unreliable option in the late innings. However, he has stated that he wants to close for the Washington Nationals, and they have no one better. There is no reason that this deal shouldn’t get done. 38. Juan Uribe – Mariners. Uribe had a good season in San Francisco last season, but not good enough to demand a crazy amount of money. The Mariners will need a third basemen if Adrian Beltre opts to leave, making Uribe a fit in Seattle. 39. John Smoltz – Retirement. Smoltz’s attempt to come back from shoulder surgery failed last season, and there is no reason to believe that he would be able to make it through a full season. I don’t believe any club in contention would take a chance on Smoltz. 40. Jermaine Dye – Royals. Dye is in the last stretch of his career, and being a former Royal may appeal to him. His market is not that big, therefore Kansas City would be able to afford him. 41. Mark DeRosa – Phillies. The Phillies have tried to acquire DeRosa for years. It makes perfect sense for both sides, as Philadelphia will need a third basemen going into next season. 42. Coco Crisp – Padres. Money is an issue for San Diego, and it helps that Crisp can’t demand a ton of it. The Padres need an outfielder, and Crisp would be a nice addition to the top of the line up. 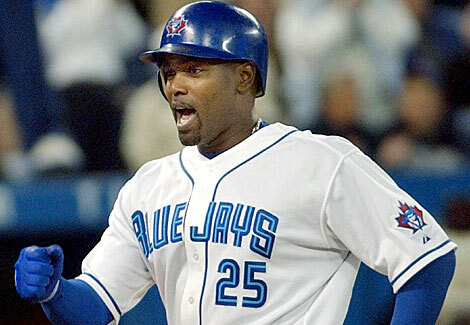 Carlos Delgado (above) could also be returning to Toronto. may want to return to his old stomping ground in Toronto. The Jays are totally devoid of power, and could bring back Delgado at a low price. 44. Orlando Cabrera – Twins. Both sides have interest, as Cabrera was the emotional leader of last season’s squad. I don’t see Cabrera going any place else. 45. Gregg Zaun – Rays. The Rays need a backup catcher, and Zaun is cheap. Perfect fit. 46. Jim Thome – White Sox. Thome has had a good run in Chicago, and the only other place I could see him landing would be Cleveland. I think the issue here will be money, and Thome will not get what he want, but Chicago will offer a little more than Cleveland. 47. Fernando Rodney – Phillies. Rodney is a good fit in Philadelphia because of his versatility. He can close, set up, and pitch in middle relief. If Brad Lidge struggles again next season, Rodney would be the best insurance policy. 48. Xavier Nady – Diamondbacks. Nady provides corner outfield depth, and can play first base. He’s not an all-star by any means, but a decent player that could help out in Arizona. 49. Kiko Calero – Rays. Calero would be cheap, and as I have previously said, that makes him a fit as a reliever in Tampa. 50. Rafael Betancourt – Rockies. Betancourt was one of the Rockies best relievers last season, and there will be interest in him. However, I think Colorado will offer some decent dollars to Betancourt, and keep him around. There is one thing that I did agree with on the site, and it is that this is a difficult puzzle. If one player signs with one team, it ultimately could effect another team’s interest in another player, and all sorts of mayhem in which is the MLB offseason. Although, I thoroughly believe that my predictions will prove more accurate. This should be another great game in the first round of the playoffs. Atlanta, relying on one of the most dynamic offenses in the NFL, will play Green Bay, who has one of the best defensive teams in the NFL. This game could be an epic battle, and the way these two teams are built, this could become a rivalry for years to come. The key factor in this game will be TE Tony Gonzalez, and will provide a nice target in the end zone for QB Matt Ryan. This is possibly the least exciting game of my projected first round, and looks pretty easy to figure out as well. The Giants will be relying on the running game all year long to carry them, and RB Brandon Jacobs will be tired and beat up. QB Eli Manning just doesn’t have the receivers to make big plays in the passing game, and the Cardinals defense isn’t too weak. Arizona, of course, has an explosive offense and will ride that to victory. Overview: The Eagles had a crazy ’08 season, that included a 9-6 record, and a tie. That tie, that everyone was criticizing Philadelphia for at the time, is what got the Eagles into the playoffs. Philadelphia took care of the Vikings and Giants respectively, before falling to the Cardinals in the NFC Championship game. Offseason Moves: The Eagles made a variety of moves during the off season. They let go longtime fan favorite S Brian Dawkins, and Ts Tra Thomas and Jon Runyan. To replace these players, the Eagles signed T Stacy Andrews and S Sean Jones, and traded for former Buffalo T Jason Peters. Philadelphia also added more weapons via the draft, taking Missouri WR Jeremy Maclin in the first round and Pittsburgh RB LeSean McCoy in the second. The team also added FB Leonard Weaver, DE Jason Babin, and CB Ellis Hobbs. The Eagles also signed QB Donovan McNabb to a contract extension, although this wasn’t the biggest quarter back move of the off season. Two weeks into the preseason, Philadelphia signed QB Michael Vick to give them more big play ability, and athleticism in the offense. The Eagles moves may not even be done, because there are many rumors that the team could bring back T Jon Runyan. Upcoming Season: When the dust settled after a busy off season, the Eagles look to have the best offense in the NFL. QB Donovan McNabb now has plenty of weapons in WRs DeSean Jackson, Jeremy Maclin, and Kevin Curtis. The running game now has two strong running backs in Brian Westbrook and LeSean McCoy. Of course, nobody knows just how QB Michael Vick will be used in the offense, but it just gives the team one more weapon. The offensive line is also solid, providing an opportunity for big plays. On defense, Philadelphia experienced a tragic loss when defensive coordinator Jim Johnson passed away a couple of months ago. New coordinator, Sean McDermott, learned under Johnson so the change isn’t expected to be to big. McDermott has a solid defensive line, that is led by DE Trent Cole. The linebackers may prove to be the weak spot for the Eagles, where LB Stewart Bradley went down with an ACL injury early in the preseason. The secondary is solid, but has a big hole that S Brian Dawkins left. Look for S Quintin Mikell to do his best to fill it. Player to watch: The farthest this core of Eagles players has gone is to the Super Bowl. That year, they had a legitimate No. 1 receiver in Terrell Owens. Now, all reports out of Eagles’ camp is that WR DeSean Jackson is looking even better than he did last season, providing QB Donovan McNabb with a big target and deep threat. Look for Jackson to step up and be the No. 1 guy for the Birds this season. It’s obvious to me that the Eagles are the class of this division, if not the NFC. With such a high powered offensive, Philadelphia could put up record numbers. Not to mention a defense that will be playing inspired football all season long. Red Sox first basemen Adam LaRoche to the Braves for first basemen Casey Kotchman: This move was strictly made to free up some money for the Red Sox, and to acquire great defense off their bench in Kotchman. Adam LaRoche now returns to Atlanta, and provides a better offense at first. Indians’ catcher Victor Martinez to the Red Sox for P Justin Masterson, P Nick Hagadone, and P Bryan Price: The Red Sox obviously needed another bat to make a legitimate run at the World Series. They got it in catcher/first basemen Victor Martinez. This trade also gives the Sox some versatility. Martinez can catch and spell Jason Varitek every now and then. Victor can also play first, which would slide Kevin Youkilis across the diamond if Mike Lowell continues to hurt. Martinez also provides a switch hitter with power in the middle of the lineup that balances Boston’s order. The Indians received three top prospects in starters Justin Masterson and Nick Hagadone, and a closer in Bryan Price. Padres’ pitcher Jake Peavy to the White Sox for P Clayton Richard, P Aaron Poreda, P Dexter Carter, P Adam Russell: In a surprise move, the Padres finally got the injured Peavy to waive his no trade clause, and accepted the White Sox trade. If Peavy comes back this year, this gives the White Sox a great one-two punch in Mark Buehrle and Peavy, and closes the gap between them and the Tigers. The Padres, on the other hand, dumped Peavy’s salary like they had desperately attempted to earlier. They also acquired three top prospects in Richard, who has started 26 games in the Majors this year, Poreda, a 2007 first round pick, and Carter, a thirteenth round pick in 2007. Adam Russell also has some relieving experience in the Majors. These players just add more pieces to the puzzle for San Diego, as they rebuild their team. A’s shortstop Orlando Cabrera to the Twins for SS Tyler Ladendorf: A move that was considered a lock, occurred Friday, as the Twins finally sured up the middle of their infield. The Twins, as many teams have, had a void in their middle infield and filled it with Cabrera. Orlando provides solid defense as well as a bat that can be placed almost anywhere in the lineup. The A’s got prospect Tyler Ladendorf, who was a second round pick in 2008, and who is currently at Single A.
Mariners’ pitcher Jarrod Washburn to the Tigers for P Luke French and P Mauricio Robles: The Mariners decided they were not in contention this year, and traded away Washburn, in the middle of a career year. This gives the Tigers a great rotation, especially a top three of Justin Verlander, Edwin Jackson, and Washburn. The interesting part of this trade is that the Mariners very well could resign Jarrod Washburn after the season. Washburn has stated that he loves Seattle, and would fit in their picture for next season. As for the players they acquired, French is a rookie this season but has been serviceable thus far. Robles is a top prospect that could be in the Majors in as soon as two seasons. Orioles’ pitcher George Sherrill to the Dodgers for 3B Josh Bell and P Steve Johnson: The Orioles coveted reliever was sent on his way for a top prospect in third basemen, Josh Bell. Baltimore figured that it will not be a contender for at least another year or two, so they got the best value they could for their closer, which would be the heir apparent to 3B Melvin Mora. Blue Jays’ third basemen Scott Rolen to the Reds for 3B Edwin Encarnacion, P Josh Roenicke, and P Zach Stewart: Reds GM Walt Jocketty had previously traded for Rolen, and now has done it again. The Reds traded young third basemen Edwin Encarnacion, along with two pitching prospects for Rolen, who is in the midst of his best season since his shoulder injury three seasons ago. Pirates’ pitcher Tom Gorzelanny and P John Grabow to the Cubs for P Kevin Hart and P Jose Ascaino: After getting a Cubs win yesterday, pitcher Kevin Hart received the news that he was traded to the Pirates. Hart and pitcher Jose Ascaino, give the Bucs some more arms to rummage through as they continue to build their team from the bottom up. The Cubs got once fourteen game winner, Tom Gorzelanny, who they believe to be on track again after struggling earlier this season. Chicago also acquired lefty reliever John Grabow, who they will pair with lefty Sean Marshall, for the stretch run. Nationals’ first basemen Nick Johnson to the Marlins for P Aaron Thompson: The Nationals dumped salary and injuries to the Florida Marlins today. Johnson, having his seemingly most healthy year, was traded to Florida for a former first round pick in pitcher Aaron Thompson. This move gives the Nats another arm on which to build their franchise. Johnson will give the Marlins a better all around player at first, as well as the versatility to play many different lineups based on match ups. Halladay: As I said yesterday, Toronto GM over played his hand based on the market, and ended up keeping Roy Halladay. Now he will attempt to deal him in the offseason, at much lesser value. This scenario reminds me very much of what went on with P Johan Santana, almost two years ago. Gonzalez: In my opinion, the Padres were never going to trade first basemen Adrian Gonzalez. He is relatively young, cheap based on his talents, and someone they can rebuild their team around. Giants: The Giants needed offense to even make it a race against the Dodgers, who have the Majors best record. They added two bats, Freddy Sanchez and Ryan Garko. Sanchez is a former batting champion, and Garko had hit 35 home runs the past two seasons. With their already strong pitching, considerably stronger than the Dodgers, the Giants look primed to now challenge Los Angeles for the NL West crown. Red Sox: Theo Epstein works in curious ways. When all is said and done, the Red Sox walk away from the deadline with Victor Martinez as an insurance policy for Mike Lowell, and a bat in the middle of the lineup. The Sox also gave up relatively little for Martinez, who they will also have for 2010. Cardinals: The Cardinals got a bat to protect Albert Pujols, and set themselves up for the stretch run with the acquisition of outfielder Matt Holliday. Besides giving up top prospect, Brett Wallace, who had questions surrounding him anyways, the Cards got Holliday for barely anything. Not to mention they acquired red hot Julio Lugo, and versatile Mark DeRosa. Phillies: Thought to be front runners for Roy Halladay, the Phillies went in and swooped up Cliff Lee for a much lesser price than what Toronto GM J.P. Riccardi was asking for. Lee gives the Phillies one of the best rotations in the NL, and cements them as serious threats to repeat. Athletics: The A’s traded away Matt Holliday and Orlando Cabrera this deadline. The boatload of prospects Oakland walked away with shows that they won’t be players anytime soon. Indians: Although I liked the prospects the Indians acquired in both the Cliff Lee and Victor Martinez deals, you can’t trade last year’s Cy Young Award winner and the best catcher in baseball, and be considered a better team. Blue Jays: Now that they haven’t traded Halladay, his value will go way down. One GM has even been quoted as saying that his value would drop 30-40%. Good luck getting what you ask for now J.P.
Analyzing the Deadline Deals so far…. A’s outfielder Matt Holliday to the Cardinals for top prospect Brett Wallace, OF Shane Peterson and P Clayton Mortenson: The obvious winners of this deal are the Cardinals. In the past, Billy Beane has been known to get top value in deals such as this, but not so this time. Wallace is a top prospect, and his lit it up in the minor leagues so far. Although, there are concerns about his defense, and his body. Peterson and Mortenson aren’t even considered top prospects. So essentially, the Cardinals gave up a bat, and a couple of mid level prospects, to become NL Central favorites. Indian’s Ryan Garko to the Giants for P Scott Barnes: It’s been known for months now that the Giants needed a bat. Garko is young, and has the potential to be a decent power hitter. Although he’s having a down year this year, Garko will split time with Giant’s prospect John Bower at first base, supplying them with some offense they desperately needed. Scott Barnes was at Triple-A for the Giants, and led the league in wins at the time of the trade. Indians’ reliever Rafael Betancourt to the Rockies for P Connor Graham: The Rockies are somehow, again, in the playoff race. Their starters have been great this whole season, while the bullpen has struggled at times. They needed to add depth before the injury of Manny Corpas, who could be out for the year. The Rockies filled the void with Rafael Betancourt. The Indians got a prospect from Single-A, in Connor Graham, that has the potential to be a power pitcher in the Majors. The Indians got just what they wanted, and are building for the future. Red Sox shortstop Julio Lugo to the Cardinals for OF Chris Duncan: Boston had been desperately trying to get rid of Lugo, and designated him for assignment last week. They had ten days to trade him, and completed a deal that got Boston Cardinal’s outfielder Chris Duncan, who had struggled the whole season. Boston sent Duncan to Triple-A, and he was acquired strictly for depth. Lugo on the other hand, went on a tear once being acquired by the Cardinals, and has kept it up for nearly a week. He fills the void the Cardinals had all season in the middle infield. Pirate’s first basemen Adam LaRoche to the Red Sox for SS Argenis Dias and P Hunter Strickland: The Red Sox added some more depth in this trade, as well as a needed bat. Adam LaRoche will play first base against right handers, while Youkilis would play third. LaRoche will sit against leftys, and ailing third basemen Mike Lowell would play third, while Youkilis would slide to first. LaRoche’s stance and swing is built for Fenway, and that miniscule right field porch. The Pirates got what they wanted out of this deal, which was dumping LaRoche’s salary, and got some decent prospects for the future. Just announced and pending physicals: Phillies’ P Carlos Carrasco, SS Jason Donald, C Lou Marson, and P Jason Knapp to the Indians for P Cliff Lee and OF Ben Francisco: After talks with the Blue Jays went dead, the Phillies turned their attentions to Cliff Lee. The Indians demands were not quite as high as the Blue Jays, which allowed the Phils to keep top prospect P Kyle Drabek and rookie of the year candidate P J.A. Happ. The Phillies gave up top pitching prospect Carlos Carrasco, who had been inconsistent in Triple-A for parts of the past two years. Shortstop Jason Donald and catcher Lou Marson were members of the Olympic squad last year, and rose quickly through the minor league system. Donald was thought to possibly take 3B Pedro Feliz’s spot next year, and Marson could have shared catching duties with Carlos Ruiz. Pitcher Jason Knapp had been struggling at Single-A all year. The Phillies got another top pitcher that they needed in Cliff Lee, and a more effective backup outfielder in Ben Francisco. More analysis on the 2009 Trading Deadline is still to come, including an overall analysis after the deadline passes. Enter your email address to subscribe to Wassup Sports!?!?!? and receive notifications of new posts by email. I want notfications of all new posts from Wassup Sports!?!?! ?